This three-hour workshop requires a $30 ticket that can be purchased at www.TheEnergyFair.org/tickets or on-site. Wind is the most difficult renewable resource to harvest, and small, commercial wind turbines are expensive. With the right knowledge, preparation, and tools, you can build your own from scratch for cheap. 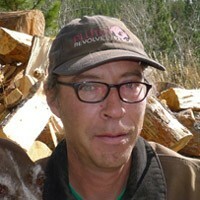 Dan Bartmann grew up off the grid in the CO Mountains starting at age three, and has lived there ever since. He is the Education Director of Buckville Energy Consulting, and co-author of the book Homebrew Wind Power. His articles and photographs have appeared in both Home Power Magazine and Back Home Magazine, and he is the founder of otherpower.com - a website devoted to home energy production. Dan’s focus and passion are on educating the public about both the potential and the pitfalls of small wind power. His innovative small wind turbine designs have achieved recognition worldwide, and are ideally suited for local manufacture in impoverished and developing regions. He teaches and consults regularly on the topic across the U.S. and internationally for NGOs, educators, and homeowners alike.